We ARE the poor kids! We’ve been donating a lot of things lately in our house and trying to teach our three year old Princess about sharing our blessings with others. First, we donated food to the annual post office food drive (you know, the one where you put your food out in a bag by the mailbox and the mailman takes it?). We let Princess help pick the food to donate, and talked about how we should give away the “good” food, and not just yuky food we didn’t want. We tried our best to explain that there are kids and families who don’t have as much as we do and what “poor means”. Last weekend we went through the girls toys in our quarterly purge and DI run (I’m not a mean mommy, we just live in a small townhouse and toys breed like rabbits here). Princess was around and started becoming very attached to things- plastic animals, McDonalds toys she didn’t even care about when it came in her happy meal, you know how it goes. I seized the teaching moment and explained that we were giving the toys to the “poor kids” and went through the whole speil again. She got into it and started pulling books and other things to give to the “poor kids”. 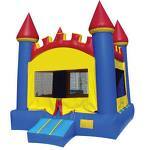 On Tuesday, our neighbor had a party that involved a bouncy castle. As I said before, we live in townhomes and we share a common grassy area behind our houses. In some evil twist of fate, the bouncy castle was set up RIGHT outside our gate. You can bet that Princess wanted to play on it. Unfortunately, we don’t know this neighbor at all (He’s a single dude so don’t ask me why he had a bouncy castle party- there were kids involved, so I’m thinking birthday party for a neice/nephew?) so we had to tell her that she couldn’t play. Guess we need to work a bit on that whole “sharing our blessings with the poor” thing. June 5, 2008. Tags: EJ. Uncategorized.